Weighty Matters: It Only Took 5 Years but Today my Book is Live! Can you imagine if pregnancies lasted for 60 months? In a way I can because it was back in 2009 when I first started writing the book that over the course of the past 5 years has matured into The Diet Fix and is today available to all. Never let anyone tell you otherwise, writing a book and bringing it to market is an enormous undertaking, and one that I never could have done without my fantastic agent Yfat Reiss Gendell, my editor and champion Leah Miller and the whole team from Harmony, my readers and patients who inspire me daily, and most of all my incredible wife - who is the real reason for everything good in my life. If you're interested in a copy, below are a pile of links to various online booksellers. Here is pharmacist Scott Gavura explaining in Science Based Medicine why he thinks The Diet Fix is a science-based guide for anyone that seeking credible and sustainable advice on permanent weight loss. 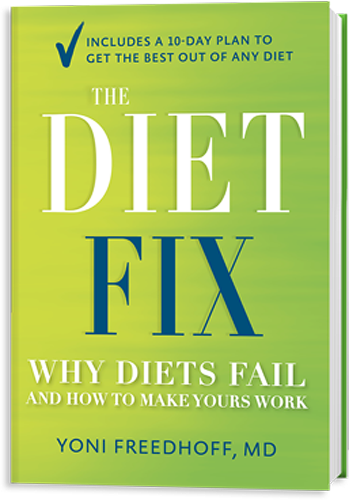 Here is health journalist David Despain calling The Diet Fix "a game changer". Here is health writer and MPH Patrick Mustain in Scientific American suggesting, "if any diet book works it's going to be this one"
And here are two Q&As I've done regarding The Diet Fix, here's one I did with Jane Langille for Costco Connections, and here's another I did with Hemi Weingarten for Fooducate.